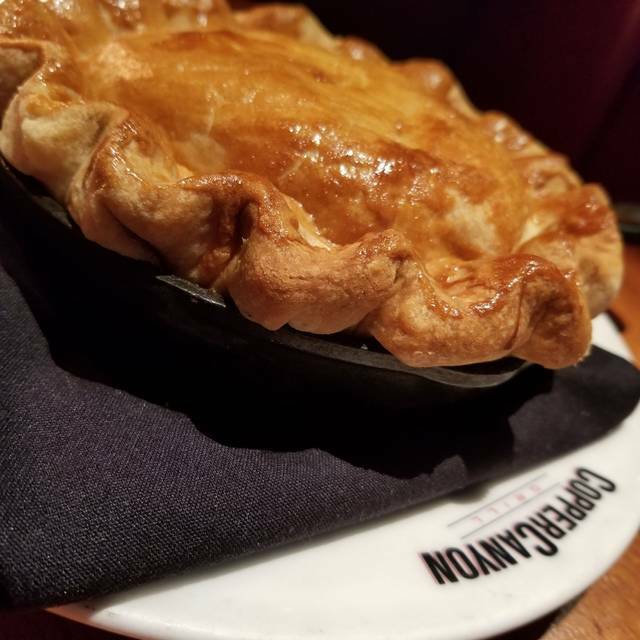 With a unique focus on creating an inviting upscale dining experience, we serve fresh, familiar food in a high-energy, sophisticated casual setting. Our chefs prepare full-flavored food from scratch daily, using fresh seasonal ingredients. We stay true to classic American comfort food that is simple, but deliciously prepared. A knowledgeable team approach provides unwavering attention to delighting our guests with warm and consistent service. 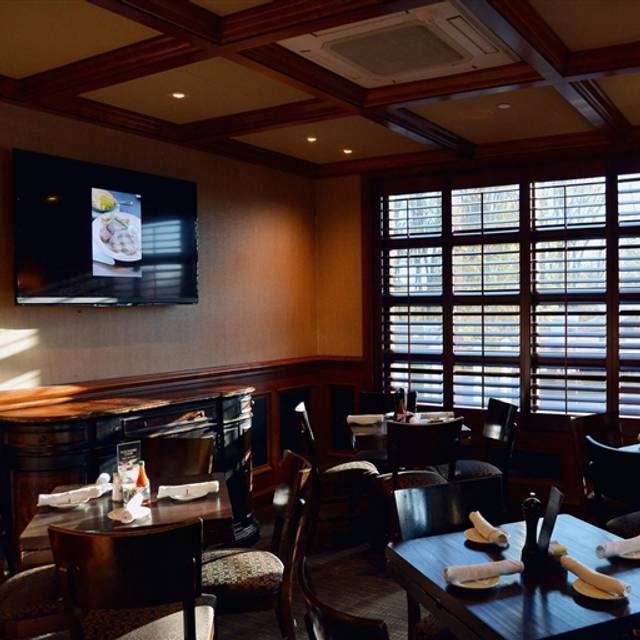 Copper Canyon Grill's timeless atmosphere appeals to discerning adults who are seeking a dining experience that is energetic, upscale but approachable. Mom deserves the best, so treat her to a special brunch or dinner featuring culinary delights and live jazz, plus a gift from us. Reserve your table today! Let us take care of the meal so you can focus on your dad. Reserve your seat today and treat dad on his special day with a special brunch or dinner featuring live jazz. Join us on Easter Sunday for brunch featuring some of your favorite items: eggs Benedict, omelet, complimentary cocktail, live jazz and much more. Brunch - 10 am - 2 pm. Our exceptional dinner menu is also available. Book now to secure your family some quality time. but I think that's because everyone is having a good time. The restaurant - on a Tuesday evening - was packed. A good sign. And, the bar area is always very lively. Over all it was a good restaurant, but way way to loud. Hard to hear the person next to you. Service was good, was very slow at the end. Food was very good, but hard to see some of the items in the salad. I would go back. With our reservation, we were able to walk right in and be seated. We waited until 2:00 to order, because brunch ended at that time. Our order came shortly and was accurate. I ordered a salad with salmon, and others ordered meatloaf, chicken potpie, shrimp and grits, and a burger. All of the food looked and tasted great. 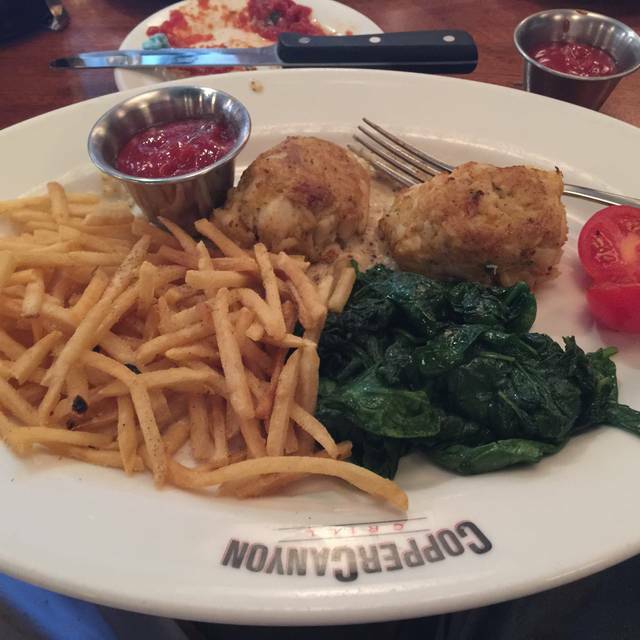 I always enjoy my experience at Copper Canyon Grill. I'm there every Sunday for Brunch and the wait staff, greeting staff and the GM Chris are always a pleasure to see and experience. They make the experience excellent every time I am there. Made reservations on Open Table for 7:45 PM, 15 mins before arrival. I arrived 5 mins before the reservations. The gentleman at the front door taking guests in look at my reservation then stated because I just made the reservation a few minutes ago I will have to wait a couple of mins. Fine. I was made to feel it was a problem making reservations so close to the time of arrival. I was under the assumption if a spot was available on open table it was available for selection to avoid wait time. My guest and I order a drink at the bar afterwards to wait for our table I had to use the restroom when I return back to where we were waiting my guest was seated but I had no idea where we were seated. The same gentleman did not inform me to let me know where the table was. I had to text my guest to locate the table. The customer service processing guest at the front door was not friendly at all. The gentleman made me feel that I should not have made reservations close to the time of reservations time. Open table doesn’t not have limitations. The grilled trout with lemon butter sauce was delicious and the collard greens were so good I purchased an extra serving to take home. It was a very enjoyable dining experience. Omg! I absolutely loved my first experience here. I’m coming back this coming weekend for the French toast! The staff was pleasant, the ambiance was great, the food was amazing and you can’t beat the prices. I am very impressed and can’t wait to tell my friends all about this place! 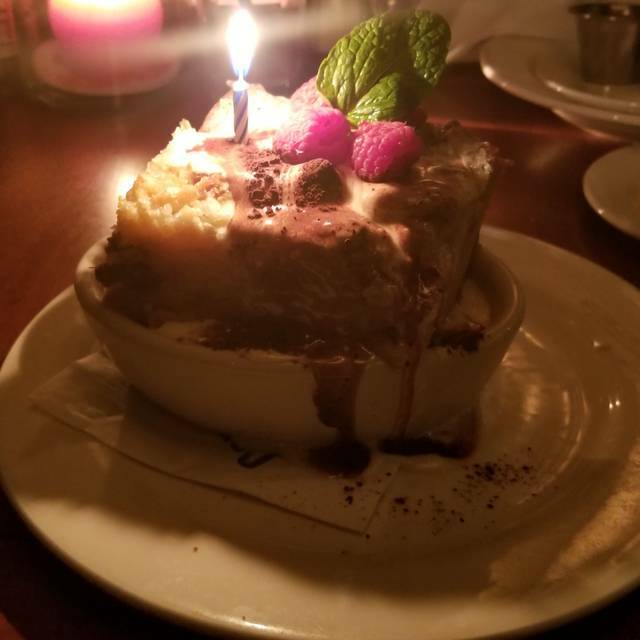 Normally, I would give Copper Canyon 5 stars but on this particular Sunday (April 7th) when I brought a friend for her birthday, the server really put a damper on our experience and her birthday. Multiple times, we were rushed through the service - one of those being before we were ready to pay the bill, she came back again and asked if we were ready to pay. I was totally annoyed. And then when the bill came, she overcharged us for beverages. Great dinning experience, service always personal and detailed. Be back soon! Our server Oscar was excellent. He was familiar with the menu and specials of the day, and he was able to offer great food and drink options for my party. Enjoyed dinner and the atmosphere...live music...excellent customer and hostess service...food was delicious... an enjoyable evening was had by us! Keep up the excellent work! Always referred to our friends and family. Polite staff. Nice atmosphere. The quality and presentation of the food was great. I did make reservations but still had to wait to be seated but the hostess kept me informed the entire time. The food is consistently good. I am upset that they took the honey glazed carrots off the menu. It was one of the tastier sides. It would also be nice if they updated their menu every now and then. Great food and staff here as always. I recommend the house salad and chicken. Though we had a reservation, we still wauted for 30+ minutes to be seatrd fue to another large party. Management was very cooperating and comp'ed us appetizers for the delay. My entire party ead wuite satisfied with tgeir meals and the evening as a whole. It was the smell outside of the restaurant that drew us in. The prices are a little high, but you’re getting what you paid for. 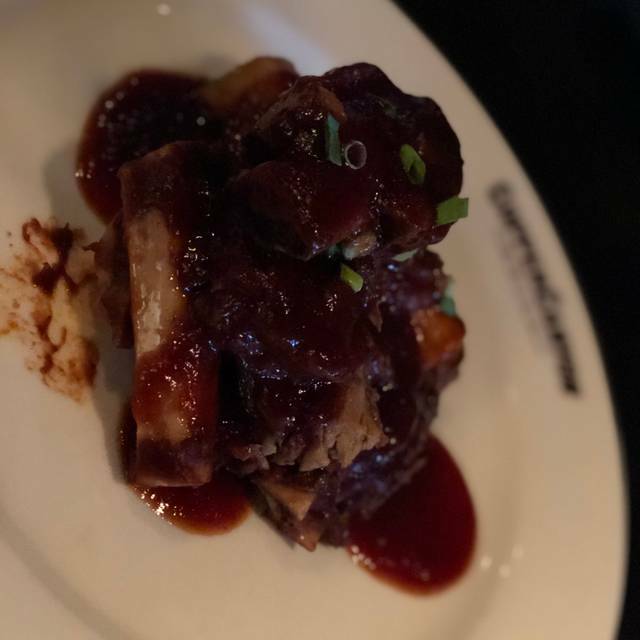 The food was fenomenal, the quality of the food is undeniable, everything was beautifully seasoned, I cannot complain one bit about the food. The service was good at first, but after our entrees came our server was nowhere to be found for a while. We had thought he had left, until later on we’ll after we finished our food he came back. I’m just suggesting that you should check on your table consistently. Overall, I recommend this place for a fancy dinner night with family or significant other. The food was excellent, fresh and tasty but this was the noisiest restaurant we’ve ever been in. Thank goodness we were escorted to a small quiet room, otherwise we wouldn’t have stayed. The service and food was top notch. The host treated me as if I did not have a reservation when I actually did. She even mentioned I was a walk-in and have to wait when I asked If I’d get points for my reservation. Then I got an email from OpenTable indicating that I missed my reservation which is not true at all. Great experience. I chose this restaurant based off of the advertisement for live jazz. Our food was great. 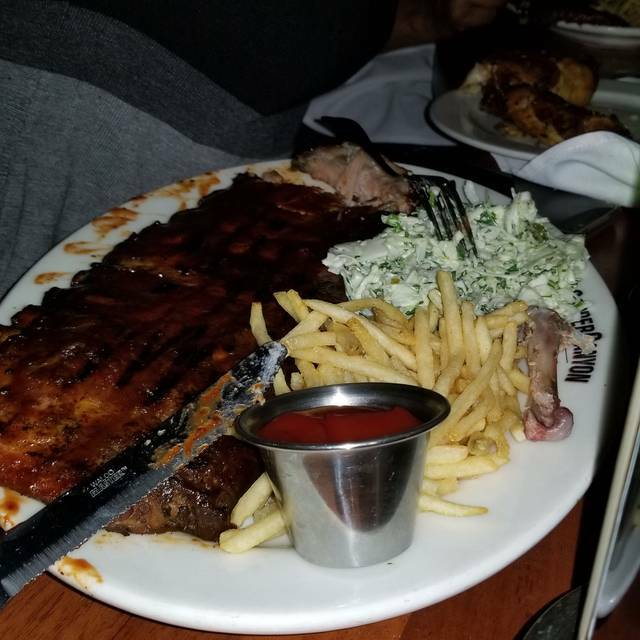 I knew goodness well I could not eat it all but I ordered an entire rack of ribs with mashed potatoes and asparagus. The staff was friendly and accommodating. Over all it was a great experience! O and it was our anniversary so the restaurant gave us free desert. The picture shows my extra the huge slice of complimentary carrot cake. 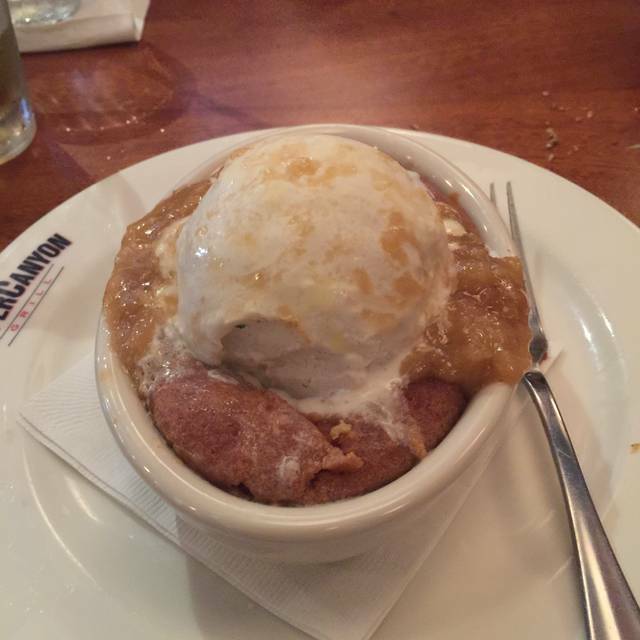 I’ve visited several times and the food is always great, tried something new at brunch and really enjoyed it. Love that it’s a great restaurant, close to home that isn’t fast food. I love the ambiance of Copper Canyon. The food is pretty decent, and the pricing is fair. I would recommend the restaurant as a good place to dine. I was greeted and the door by cheerful young people. My waiter was an older gentleman. He was polite and very professional. What my friend and I didn't like was he was very slow and forgetful. We didn't have to wait long for our food which was a plus in my book. Although there was a gluten free menu to accommodate my needs. I am also a vegetarian. So it wasn't much for me to eat. The atmosphere was a delightful. We had a wonderful time having dinner on a date night. Nice option for a family Friday night dinner. Our waitress was awesome and food was great. Overall very good experience. I highly recommend Copper Canyon Grill. 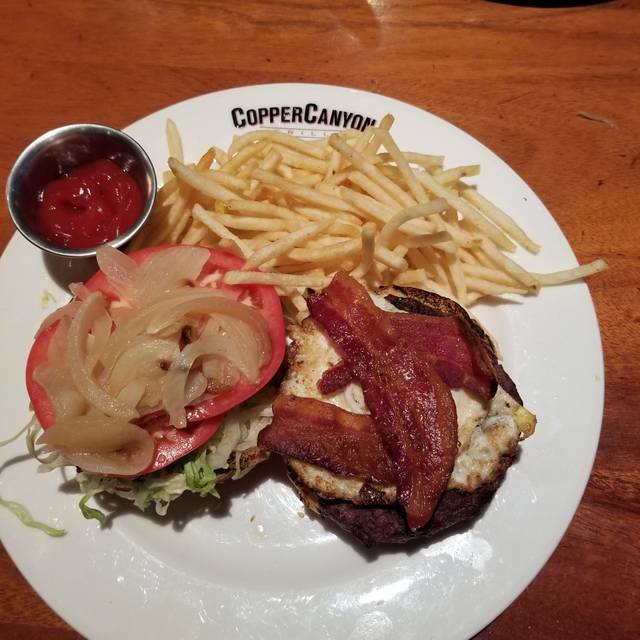 Copper Canyon is always as you expect it; it doesn't disappoint. It's a great place to meet for lunch or dinner, or to have a drink with friends. It's a lively place - probably not an ideal location for a business meeting. The food is consistent, if not inspired. The waitstaff is pleasant. We will be back. I was quoted a 45-1 hour wait for a party of 5. We waited a hour and 10 min. The food was great, but the service was just ok. The server was friendly, but away from our table for most of our visit, and didn't do a good job of explaining the menu. Overall is was a good experience, with the food making it better after the wait and service. The manager Chris is the absolute Best! He is always making sure the guest are doing well and their meals are what they ordered and tasty. He can be seen behind the scenes and out in the restaurant as well. He is very caring and about the business of making sure Copper Canyon is giving the best service at all times. It is appreciated. 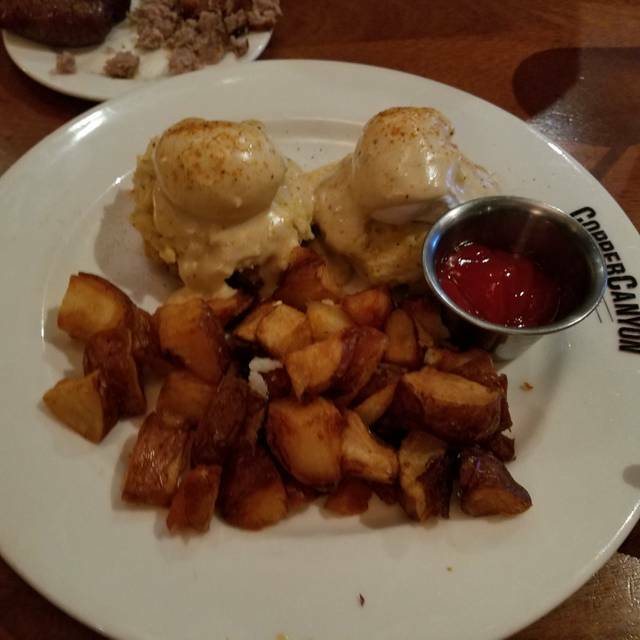 Went to Copper Canyon Grill recently for Sunday brunch with my girlfriends and it was a truly enjoyable experience. The brunch selection was very good with a fairly wide selection of various omelets, egg benedict and pancakes with fresh blueberries. The coffee is French pressed right at your table, and the waitstaff are wonderful. The live 3 piece jazz ensemble was the icing on the cake! Can't say enough good things about this place. I love being able to make reservations so you don't have to worry about waiting in line to be seated. Can't wait to go back.